A bicyclist who was struck by a hit and run motorist is in critical condition at a Stockton-area hospital. 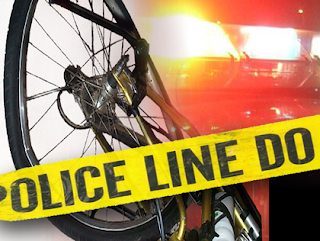 In the early afternoon of Wednesday March 8 the victim was on Lincoln Street near Sonora Street in the Seaport District when a southbound vehicle struck the bicycle. The vehicle fled south on Lincoln Street. The suspect vehicle is a light Hyundai sedan NFD, occupied by a light skinned male with tattoos on his face. The bicyclist is in critical condition with a fractured skull and brain bleed. Traffic responded.